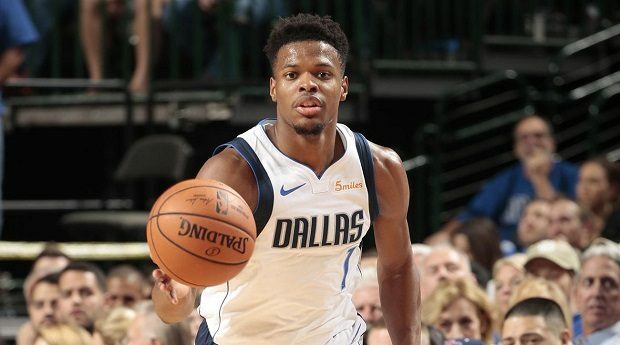 The Dallas Mavericks are expecting to have second-year point guard Dennis Smith Jr. back with the team for Tuesday’s game against the Los Angeles Clippers, according to a report from ESPN’s Tim MacMahon. Smith has been away from the team for five games with what has been described as a back injury and illness, though the absence has come in the midst of trade rumors. Smith released a statement through the Mavericks’ PR department about the situation. “I am thrilled to rejoin my teammates on Tuesday,” Smith said. “I am feeling better and had a great workout today. It has been difficult to be away, but I look forward to getting back on the court and helping my team win.” Last week, ESPN’s Adrian Wojnarowski reported the team was “escalating discussions” to try and find a trade for the youngster. Per Wojnarowski, they had discussions with both the Phoenix Suns and Orlando Magic. The 21-year-old Smith was the No. 9 overall pick in the 2017 NBA Draft, but there are already concerns about whether Smith can be a long-term fit next to the Mavericks’ face of the future, Luka Doncic. Doncic primarily operates as a point forward when he’s on the floor, and has already established himself as the team’s best player. Smith, meanwhile, is not the best at playing off-ball, and the Mavericks haven’t fared well when they play together. For the season, the Mavs’ net rating is minus-five points per 100 possessions in 687 minutes with Doncic and Smith on the court. While in the 719 minutes Doncic has played without Smith, the Mavericks are outscoring their opponents by 2.8 points per 100 possessions. That’s obviously a huge difference. It’s unclear what Smith’s role will be when he returns to the team. Likewise, it’s unclear exactly what the market will be for Smith if the Mavericks continue to explore trading him. There aren’t a ton of teams in the league who need a point guard, and the Mavericks are selling pretty low on the former top-10 pick. Still, it might be worthwhile for a team like the Suns or Magic to take a flier on him considering their dire point guard situations.